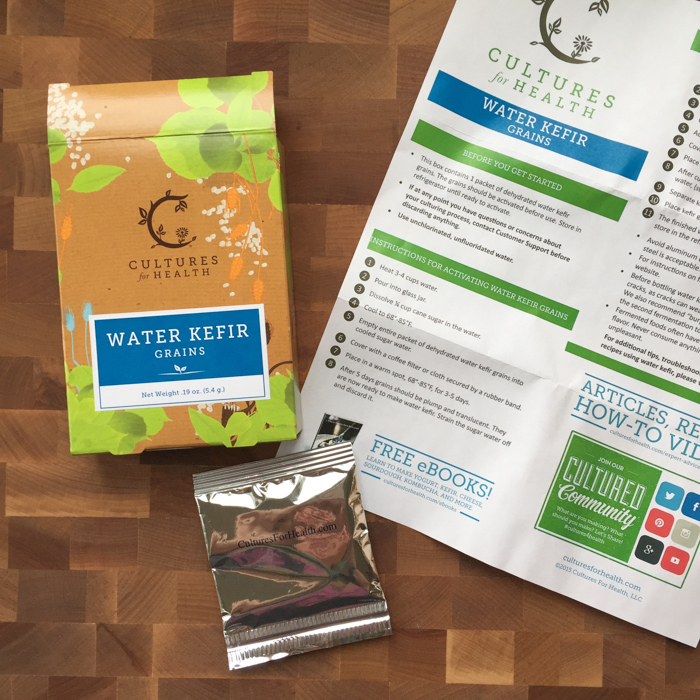 A few months ago I picked up water kefir grains from Culture’s for Health at Moscow Food Co-op (also available on Amazon). I hadn’t hit my stride with kombucha yet (keyword yet) and wanted to try my hand at other fermented beverages. 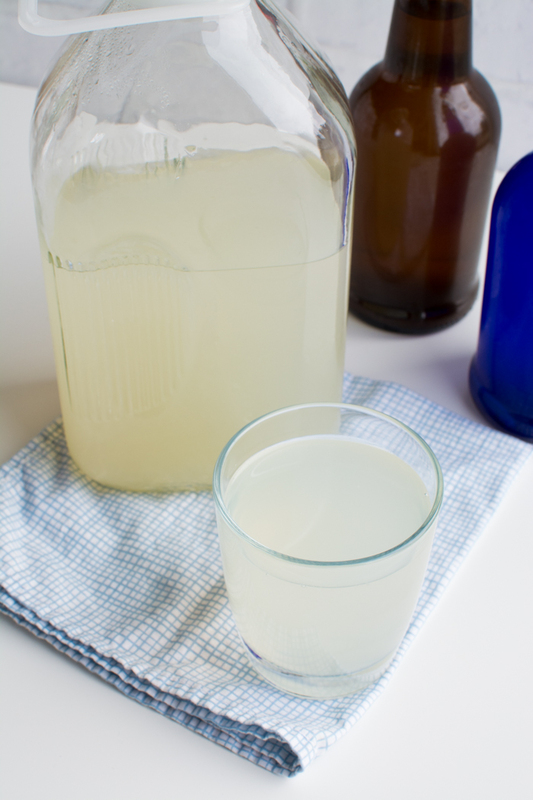 Water kefir is a culture or bacteria—the good kind—that ferments a sugary/carbohydrate-rich liquid. What are the grains exactly? They are not a grain like barley, wheat, or rye—but they look like they could be hence the name. 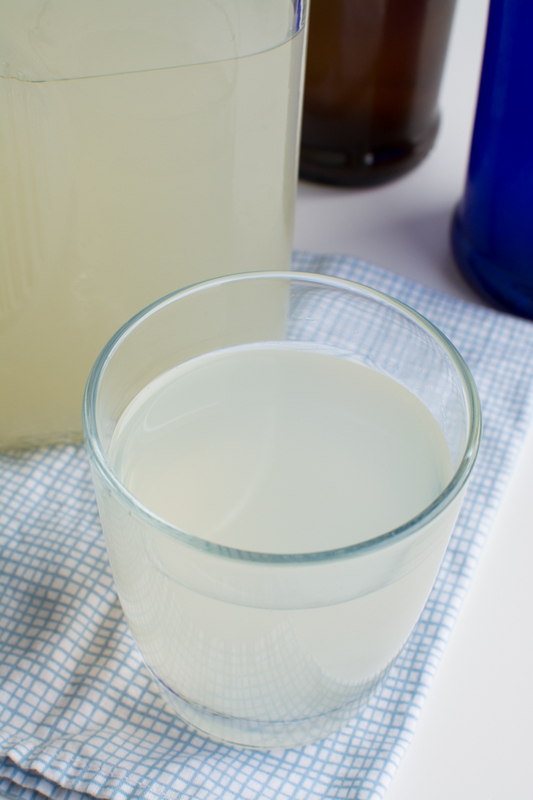 Water kefir grains are pale and translucent with a soft cartilage texture. If you are familiar with kombucha, water kefir grains are the SCOBY (symbiotic colony of bacteria and yeast) of water kefir. They get the party started by initiating fermentation. Each grain is a combination of bacteria and yeast carried in a group of bonded sugar molecules (that cartilage texture again). They produce a probiotic-rich beverage by feeding off of a sugar-based liquid creating lactic acid—similar to sauerkraut except in that cabbage-case we add salt to prevent the bad bacteria which allows our good bacteria to flourish and ferment. With kefir our good grains/bacteria already control the party. The resulting ‘good bacteria’ feast produces a rich carbonated beverage. 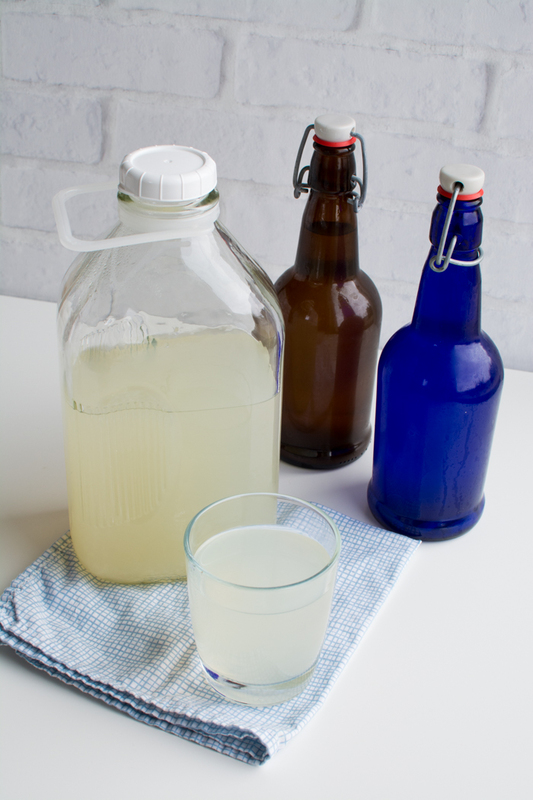 Water kefir is a great way to enjoy the health benefits of probiotics if you want to avoid fermented tea or dairy products. Very vegan-friendly! A starter pack like the one I bought was in the refrigerated section near rennet and other probiotic-rich starters and foods. It came in a little cardboard box with a packet of dry water kefir grains that need to be awakened and a set of easy-to-follow instructions. I think the kit was about $17. You only need the one though, because just like sourdough or a kombucha scoby as long as you feed it, it will keep producing. I would suggest not bringing to a boil as I did the first several times, just enough heat so the water is warmer than room temperature. I’ve been using a 68 oz Bormioli Rocco jar or a 32 oz mason jar. Organic cane juice crystals, raw sugar, sucanat, brown sugar or refined white sugar can be used. I used my kombucha heating pad. If I set it to 4 or 5 the average temperature stays around mid to upper 70s. This applies to any season other than summer where I live. I recommend a nylon sieve or nut milk bag. Checking the temperature so I can add the grains! Let’s get to the good stuff. You’ve now brought these little Frankenstein grains back from Sleeping Beauty land…what’s next? It’s almost exactly like the activation process, but less waiting. Right away I noticed that water kefir’s carbonation was stronger than what I was getting in my homemade kombucha. I was like f*&% homemade kombucha I’ll make water kefir from now on! I’ve since figured out my kombucha issue, but at the time I just wanted to focus on making water kefir. For bottling use mason jars with tight-fitting lids, reuse glass bottles you’ve purchased, or get easy cap bottles like in the above picture. With the first two options you can still get full carbonation, but it might take a little longer for the pressure to build. This also depends on how warm your living environment is. Warmer climates speed this process along. Either way, a lot of carbonation or just a little, water kefir is ready to drink immediately. Decide the rest from personal preference. 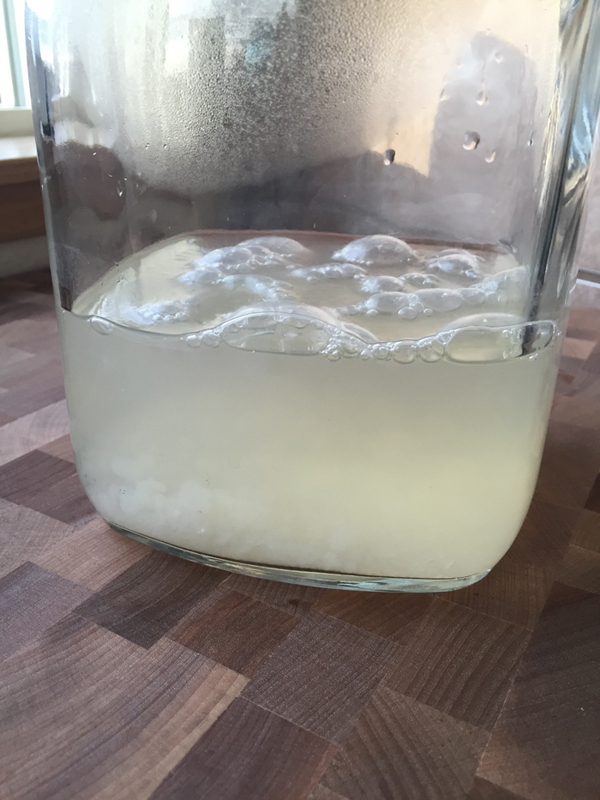 Plain water kefir that has gone through a 48 hour ferment cycle in optimal temperatures has a light lemony/tangy flavor, you can almost detect the familiarity of a good plain yogurt. It’s good as is, but who doesn’t want to play with flavor combinations?? First rule of flavoring a ferment, a little goes a long way. Examples: grapefruit, lemon, pomegranate, blueberry, strawberry, blackberry, cherry, etc. How much: 1/4-1/2 cup. If using fresh fruit, replace fruit everyday. If using dried fruit, replace as little as once a week. I love using sugared ginger. I take one small piece, dice it, and add it to my bottle. Thawed or fresh fruit works great. Try mango, apple, fresh ginger, blueberries, and strawberries! 32 oz mason jars work great or old GTS bottles with less fruit. Finished water kefir lasts 2-3 weeks in the fridge. What if you want to take a break? 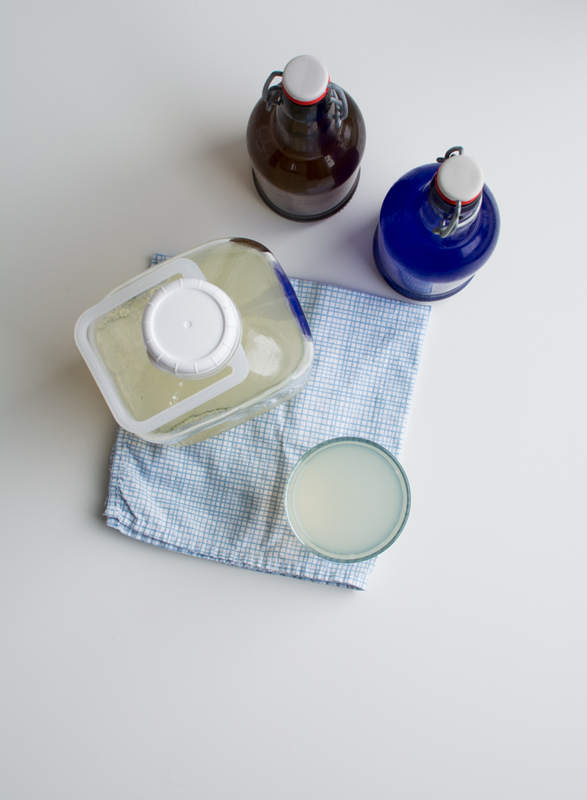 Because turnover time is so quick with water kefir it’s good to figure out in the first couple of batches how often you drink it and how much you want to. I started with the ‘go big or go home’ approach of 8 cups, which was a little more than I could keep up with. Jeremy will drink something if I suggest it, but somethings he’s just not inclined to reach for even if they taste good/have benefits. I’m the same way sometimes! So after about 2 weeks I started having trouble keeping up with what was in the fridge, so I let the one fermenting go looooong. You and your grains can come back from that, but as with anything it’s nice to avoid that process. If you’ve made enough for the fridge and you’re ready for a break, do steps 1-5, secure with a lid, and place in the fridge. This should keep the grains happy and active. It’s like a little water kefir grain retreat. I think you’ll want to repeat the process every 2-3 weeks to keep them fed. I never knew how to make Kefir when I saw this blog. I have an experiment in making water kefir. Thank to this blog.